When Kingdom Hearts makes its way to the PSP, Co-op will come with it. 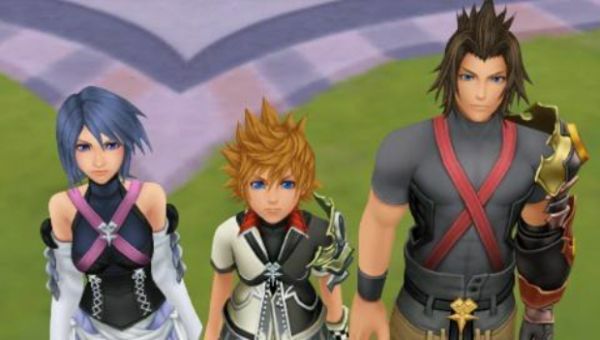 Focused around the characters Terra, Ventus and Aqua, Kingdom Hearts: Birth By Sleep will have 3-player link-up co-op. This particular co-op will take place in the battle realm called the Mirage Arena. This arena will give players the opportunity to replay bosses cooperatively, or select special co-op levels to play through. While Kingdom Hearts: Birth by Sleep is at the Tokyo Gameshow, there is a good chance we'll learn more about what the co-op in the game will be like. For now, Video-game-central.com has these details for us. "Co-Op alters the gameplay somewhat, as there will be unique commands for players to use in the Mirage Arena, including the ability to cast positive spells on their friends to help cure them and more. Each player wears different colored armor in order to distinguish between one another." Kingdom Hearts: Birth by Sleep will be a PSP exclusive, due out this winter in Japan with no word yet on any other region release dates.